SeniorsAloud: A RACIAL HARMONY DAY FOR MALAYSIA? 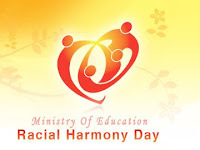 Every year Singapore celebrates Racial Harmony Day on 21 July to mark the anniversary of the 1964 racial riots. Can you imagine Malaysia having a special day to commemorate the 13 May 1969 riots? In Singapore on this day, students reflect on and celebrate the nation's success that is built on a rich diversity of cultures. Schools encourage students to dress in their ethnic costumes on this day, and various events are held to promote inter-racial understanding. This year the Ministry of Education has chosen the theme “Embracing Diversity, Building Community” to remind Singaporeans that promoting social cohesion and racial harmony requires constant effort from everyone. It is also a day to honour not only the founding fathers but also the early pioneers of all races who helped develop the country. 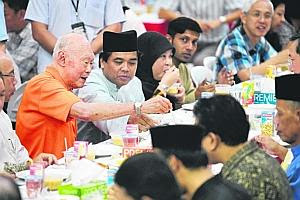 It's not just on one day of the year that efforts are made to promote racial harmony. It's an on-going process, and the evidence is there for all to see. 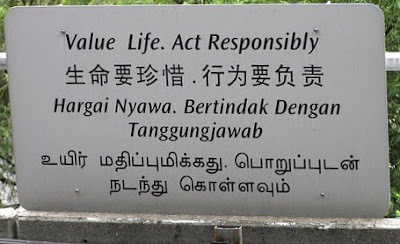 Public signages and MRT announcements are in four languages: English, Mandarin, Malay and Tamil, although the Malays and Indians make up only 13 per cent and 9.2 per cent of the population respectively. The PM's recent National Day Rally speech was delivered in English, Mandarin and Malay. Last Saturday I joined the thousands of shoppers and visitors at the sprawling night market in the Malay village at Geylang Serai. The entire neighbourhood was bathed in festive colours and lights for the coming Raya celebrations. What struck me most was the multi-racial mix of the vendors and shoppers. The festive lights at Geylang Serai. Chinese vendors selling fruits and cookies for the Raya celebration. Rows upon rows of figure-hugging kebaya in dazzling rainbow colours. Malaysia's famed Ramli burgers are a hit here. Indian shoppers buying flowers from Chinese vendors at the Malay village. Stall selling halal leung-yuk (dried meat) doing brisk business. Everywhere you go in Singapore you see people of all races mixing freely and comfortably with each other. Lots of mixed couples too. Across the street from my Singapore base are a mosque, a Chinese temple, an Indian temple, a church and a gurdwara (Sikh temple), all within a stone's throw from each other, and all with doors open to welcome visitors. Chinese passers-by praying outside an Indian temple. Just next to it is a Chinese temple. Both have been co-existing peacefully in the area for decades. There's plenty Singapore and Malaysia can learn from each other about fostering racial harmony in diversity. 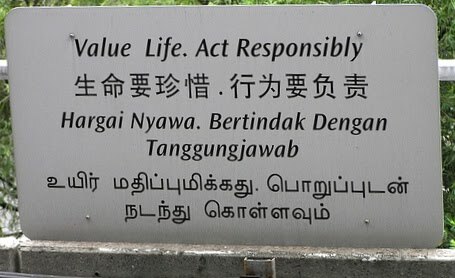 I am sure the Singapore government is keeping an eye on what's happening in Malaysia and learning WHAT NOT TO DO. It's about time the Malaysia government put aside bruised pride and learn WHAT TO DO from Singapore. After all, we are supposed to be more than good neighbours. We are bound by more than historical and ancestral ties. Indeed the same blood runs through all of us, whatever our colour, creed or religion. Hi E-lf, I have always admired Singapore's Government...and LKY sure made Singapore what it is today, a country smaller than the area we live. But this much I know, Singaporeans real proud of their country....proud of their leaders too. Recent revelations about the audacious looting of the nation's coffers via corporate hanky-panky presided over by Umno leaders beginning with Mahathir explain why they resort to stirring up racial tension just to cling to power.